Mixed dried fruit, orange juice, molasses, and spices dress up plain-Jane corned beef with lively new flavor in this main-dish recipe. Trim fat from meat. If necessary, cut meat to fit into a 3-1/2- or 4-quart slow cooker. If a seasoning packet is present, discard it. Place meat in the cooker. Cut any large pieces of mixed dried fruit into quarters. 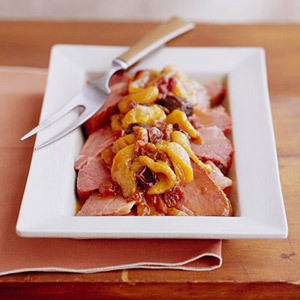 Sprinkle mixed dried fruit, dried cranberries, and tapioca over meat in cooker. In a small bowl, combine orange juice, the water, molasses, cinnamon, and nutmeg. Pour over mixture in cooker. Remove meat from cooker. Thinly slice meat across the grain. Arrange meat slices on a serving platter. Spoon fruit mixture over meat. Makes 6 servings.